A lot of companies target “ice dam removal Minneapolis MN” but not all use low psi steam. Many ice dam removal companies targeting ice dam removal Minneapolis MN are using hot pressure washers which can damage roofing materials. We are proud to announce that we are an “approved member” of the Ice Dam Steaming Association For Education. Which means our steam equipment and our procedures are safe and gentle on all roofing materials. Do Insurance Companies Cover Ice Dam Removal Cost in MN? How Do I know if I have an Ice Dam Problem? Why Do Ice Dam Removal Companies Work on an Hourly Basis Only? The Red Flags to Avoid When Hiring an Ice Dam Removal Company! Why is Ice Dam Removal Important? We offer 24/7 emergency ice dam removal services with steam in MN to all Minneapolis, St. Paul, Twin Cities Metro areas including all surrounding suburbs for residential and commercial properties. We offer fully insured experienced ice dam removal with steam and have safely removed thousands of ice dams from all types of roofing materials and pitches. We know that low pressure high temperature steam is the only safe way to remove ice dams without damage. We use the highest quality ice dam steaming equipment available in the industry combined directly with the latest technology to offer our MN customers the fastest and safest ice dam removal with steam possible. At this point in time we are the first and only company to run both a pressure gauge and a temperature gauge on all of our steamers at all times and we are the only company who speaks of this. 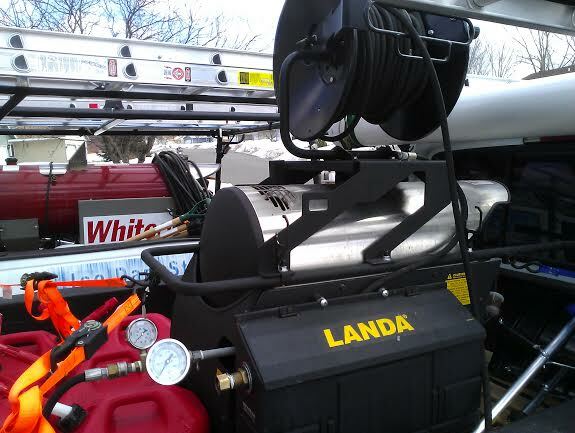 Utilizing both gauges on our machines ensures that we are running our equipment correctly and guarantees that we are not using hot water high pressure power washers as a lot of so called ice dam experts are doing. We are very much against pressure washers on roofs and you should be too! We use low pressure high temperature steamers only. Our steamers are specifically designed for ice dam removal and ice dam removal only. We operate our business with integrity and we do our very best to get to each and every customer quickly in an emergency. Contact us now or call us @ 612-919-4185. Absolutely Clean is proudly removing ice dams in Minnesota with the very best ice dam steaming equipment available in the industry combined directly with the latest in steam technology for a job done right! We understand temperature and pressure and you should too. We operate our business with integrity and we are open and up front about our machines and our technology. Most companies will not show pictures of their machines because they are using pressure washers and not low psi steamers. Included below are a few pictures of some of our steamers with pressure and temperature gauges. We welcome all inquires and will speak to anyone with questions. We truly care about you and your property and we will go the extra mile to satisfy all questions. We believe that there should be no unanswered questions about machines used or proper procedures in the ice dam removal industry. We want your complete confidence in us and that’s why we go above and beyond to prove we do ice dam removal with integrity every time. See our You Tube Videos Here. Contact us here now or call us anytime at 612-919-4185. Having two people on every job is a must. This method ensures our safety, the safety of your property and ours, as well as maximum efficiency when removing the snow and ice dams from your roof. Never hire a company who only uses one person. Someone should always be close to the steamer at all times! The first step in proper ice dam removal is removing all the snow from the roof, and not just some along the edges. We never recommend just removing the ice dams and not the snow. If the snow is left on your roof there is a very good chance another ice dam will form. During the snow removal process two people are either on the roof carefully using plastic shovels, or using plastic roof rakes from a ladder or from the ground. We never ever use metal snow removal equipment on roofs! We can remove all the snow on any roof no matter how high or steep. We use safety equipment when certain conditions are met such as height and pitch. The next step is removing the fallen snow from areas on the ground as needed such as sidewalks and driveways. We always have snow blowers to move the massive piles of snow from the ground. Removing all the fallen snow from your property is not a one man job and that is another reason we have two ice dam technicians on every job. Once the snow is cleaned from the ground we begin to set up the machine for the ice dam steaming process. Once the steamer is running at operating temperature the ice dams can be steamed free from the roof and gutters. We never need to leave the roof or ladder while steaming to fuel up our machines or to warm up because the two people can switch places as needed. Running an ice dam removal company with only one guy per job is very dangerous and not efficient and should never ever be done! One person is always steaming the ice dam while the other person makes sure the steamer stays fueled up and is operating correctly. During the ice dam steaming process the person on the ground can also clean up the fallen ice dams and watch for potential hazards such as AC units and windows. The last step after the ice dams are removed and the equipment is packed up is to discuss what options you have for preventing ice dams from forming in the future such as better insulation in the attic, more ventilation or installing heat lines on the roof or in the gutters. 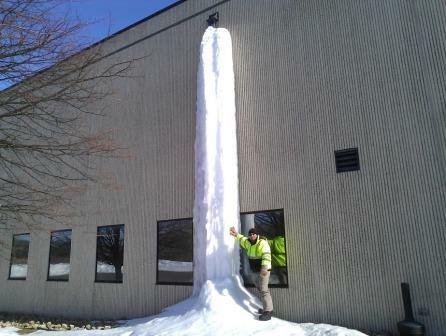 We want to help you and your MN roof avoid ice dams forever! Roof leaking? Contact us quickly or call us 24/7 @ 612-919-4185. 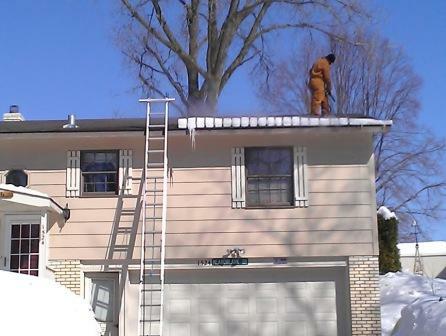 We Can Remove Ice Dams From All Roofing Materials in Minnesota. Roof leaking water? Get help here quickly! Or call us day or night @ 612-919-4185. See Absolutely Clean Window Washing on the News about Ice Dam Removal in MN! Absolutely Clean & American Pressure Inc. share a passion for doing things with integrity, so they joined forces and were featured together on Fox 21 News in MN to inform people that a lot of companies with pressure washers are claiming they use steam when in fact they don’t. These companies are lying to customers, taking their money and leaving them with damaged roofs. This news story explains why you should never ever allow a pressure washer on your roof. This is a great video to demonstrate why low pressure steam is the only safe way to remove ice dams. Please watch this Fox 21 news story to learn more about why steam is so safe for ice dam removal and to see how a hot water pressure washer can ruin your roof. Many people have learned the hard way that pressure washers can cut holes completely through the roof. So please educate yourself first by watching this video and avoid this huge headache. Contact us here or at 612-919-4185. Absolutely Clean Window Washing is Minnesota’s smart choice for ice dam removal because we truly care about every customer and their property and we operate our business with integrity, every job every time. Some companies lie on their website and over the phone about their so called steam equipment and show up with pressure washers hoping you won’t know the difference. Absolutely Clean uses low pressure steamers only and we can prove it! No ice dam blasters here! We have the newest and best steaming equipment available in the industry and we combine our steamers with the latest technology available. We are the first company in MN to run our machines with both a pressure and temperature gauge and the only ice dam company so far that we know of who speaks of this. The use of gauges ensures we are running our machines correctly every time for the safest and most efficient ice dam removal possible. We always have two guys on the job at all times and not just one. We remove all the snow from your roof and not just along the edges. We use plastic shovels and roof rakes, never metal. We bring our own snow blowers. We use ladders all year round and not many people spend more time on ladders than us. We have great reviews! The owner himself was a roofer for over 7 years and has completed all types of roofing jobs from shingles to rubber to hot tar and personally trains each ice dam technician. We understand how ice dams form and we know how to prevent them in the future. We can closely work with insurance companies. We work with the best insulation companies who offer free inspections. We inspect every roof after the steaming process to look for potential problems. We understand attic ventilation and we check to make sure there are enough roof vents. We can install heat lines as a last resort if the insulation and ventilation are adequate. We are fully insured for ice dam removal services and accident free. We have many years of ice dam removal experience and have completed thousands of residential and commercial ice dam jobs. If your roof is leaking we can get to you quickly for our emergency ice dam removal services. We use OSHA approved safety equipment when needed and we don’t use sub-contractors. Give us a call at 612-919-4185 or contact us here now. Never allow anyone to use a hot water pressure washer, hammers or chemicals on your roof to remove the ice dams because this will destroy your roof. Many companies claim they are using low pressure steamers when in fact they are running high pressure hot water pressure washers that truly cannot produce steam at all. These hot water pressure washers are very dangerous because the 1000 to 4000 psi of high pressurized water can easily cut through roofing materials. Steam is safe and gentle because once the water has been atomized and turned into steam it can no longer cut through materials like water can. Steamers designed for ice dam removal will run at a very low psi, usually between 150 to 300 psi and operate with temperatures between 250 to 325 degrees Fahrenheit. Water begins to boil at 212 degrees but good soft gentle steam acceptable for ice dam removal is produced between 250 and 325 degrees Fahrenheit. Pressure washers can generally only produce temperatures between 120 and 180 degrees Fahrenheit continuously with cold water and therefore still produce water and not steam. This highly pressurized water easily ruins and cuts through roofing materials. Some pressure washers claim to produce 250 degree Fahrenheit wet steam but the catch is you must input 140 degree Fahrenheit hot water continuously! Whose water heater can keep up with that for hours on end? Not many! And even if that were possible on a commercial property the pressure is still unable to be turned down low enough to make it safe for ice dam removal. So truly the water can only be heated to about 110 degrees Fahrenheit while using cold water. Pressure washers have become a big problem in MN in the ice dam removal industry because they are much cheaper and easier to obtain. This is a much more common problem than one may think and hundreds, possibly even thousands of roofs are ruined every ice dam season. 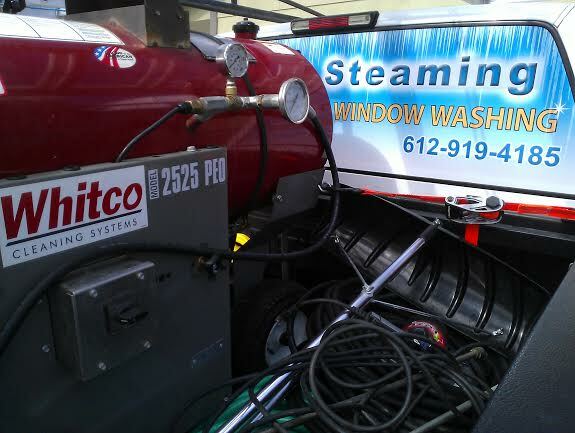 Steamers and pressure washers can look very similar and in fact some companies produce both a steamer and a hot pressure washer that look almost identical to the untrained eye. Even with all the similarities the differences are huge! The three easy ways to identify a pressure washer from a steamer are the trigger on the gun handle, the tips on the end of the wand and seeing a pressure and temperature gauge combo. You as the building owner could also use your own temperature gauge to test the water/steam discharge if you are still unsure. But determining the pressure is impossible without a pressure gauge. Please study the comparison chart below to see the many differences and learn how to identify a pressure washer from a steamer. Remember, high pressure hot water is bad news on any roof! If a company cannot prove they are using a steamer it is probably a pressure washer. A steamer designed for ice dam removal will remove the ice dams safely and at least ten times faster than a pressure washer because the steam can be placed directly down on the roof to cut underneath the ice, whereas a pressure washer must be held a great distance off the roof to melt the ice and prevent significant damage to the roofing material. Note: No matter how careful someone with a pressure washer is they will still remove a lot of sand from the shingles and this will cause premature roof failure at the very least, and they could also very easily cut holes through your roofing material. And no one wants to spend huge money to re-roof their property before it was necessary. Companies with pressure washers will generally lie about their equipment and charge just as much per hour as a steamer, but the truth is, high pressure can never beat high temperature in a race to remove ice dams safely, and you and your roof will pay dearly in the end if you choose to hire someone with a pressure washer. These facts are undisputed and we welcome anyone using a pressure washer to an ice dam removal race (on your own roof of course) and without damage to the roof. It cannot be done without damage, period! Please see our graph below to learn how to identify a pressure washer from a steamer. For help quickly contact us here or by phone 612-919-4185. Please study the graph below and learn how to easily identify the right equipment for ice dam removal. Making the wrong choice about an ice dam company and their equipment could cost you tens of thousands of dollars! There are many different brands of steamers so we chose one of the most common. Likewise there are many brands of hot pressure washers so we chose the one people most often lie about and call a steamer. These hot pressure washers are great for their intended uses but not for ice dam removal. If you have ice forming behind the gutters and fascia or leaking through the soffits and or leaking down the siding we can often deal directly with your insurance company to resolve your ice dam issue as cheap as possible for you. In many cases insurance companies would rather pay us to remove the snow and ice than to pay for the costly interior repairs. They often deal directly with us because we can also fix any damaged or leaking areas after the steaming process so they won’t leak again. We can take pictures of the ice and or water leaking and show them to the insurance company. A good insurance company will usually want to save money by removing the ice before water enters the building. If the insurance company accepts your claim you will only pay the deductible. But we would not recommend waiting this long to remove the ice because by this time your roof has already been damaged. Also there is never any guarantee the insurance company will pay for the snow and ice dam removal. So please call us before you get a leak. Contact us. We receive a lot of ice dam removal calls from both commercial and residential properties in MN and we steam both often, but the majority of our calls are from residential properties with pitched roofs. These include single family homes, multi family homes, twin homes, duplexes, condos, town home associations, apartment buildings, hotels, motels, restaurants, office buildings, churches etc. Ice dam removal on commercial properties mainly includes buildings which produce a lot of heat inside such as high rise apartments, hospitals, restaurants, metal shops, plastic injection molding, manufacturing, warehouses, assembly, etc. A lot of these commercial jobs involve steaming the areas on the roof near the exterior scuppers, downspouts and drains to open them up, and it’s common for us to remove the large icicles forming on the outside of the downspout and building. Sometimes this requires a boom lift or a harness/chair system to hang over the edge of the building, “a window cleaner’s expertise.” Most often we can use a combination of steam from the roof and steam from a ladder. Ice on a downspout can ruin and/or pull the downspout off the building and cause serious bodily injury and property damage if it falls. Likewise ice dams that fall off of residential structures can also be very destructive and dangerous. Get help now! Why Do Ice Dam Removal Companies Work on an Hourly Basis? All experienced ice dam removal companies will work on an hourly basis and the reason for this is simple; there is just no good way for us to determine the amount of ice that lies buried underneath the snow. We do however give you an estimate of how many feet of ice dams we can steam on average, and with that information you can get a close idea of how many hours your job should take. However, if you have removed the snow already and are willing to send us some good pictures we can usually give you a fairly accurate idea of how many hours your job should take. Every job is different and each job requires a different strategy that we cannot predict until we actually see your job, but we do like to give you the averages so you know what to expect. The other important reason companies work on an hourly basis is because the last place in the world we need to feel rushed is on a frozen steep slippery roof in the arctic temperatures of winter as we are dealing with wet freezing conditions. When people rush and cut corners safety tends to become second to getting the job done and that is very dangerous in the ice dam removal business. Safety is always first! Inquire about hiring us. Avoid hiring a company who wants to hook their machine up to hot water! These companies are using pressure washers that will not produce steam! Avoid hiring a company who cannot at least prove the temperature their machine produces. Our company uses both a temperature gauge and a pressure gauge at all times on our machines to guarantee we are not using high psi hot pressure washers. Eventually (we hope) this will become an industry standard and will eliminate pressure washers used on roofs. Avoid hiring a company who only uses one guy on the job site. These companies generally charge the same amount as most companies do for two guys. This is dangerous and not efficient and will cost you more money in the end. Snow and ice dam removal is not a one man operation! Avoid hiring a company with a suspiciously low hourly rate. Running an ice dam business with the right equipment is not cheap and experience proves that. Avoid hiring a company who offers a free estimate; instead look for a company who has an hourly rate with an average length of ice dams removed per hour. Avoid hiring a company who will not remove all the snow from your roof and walkways. Avoid hiring a company who uses sub-contractors, instead seek a reputable company who owns their own equipment and has references and experience and trains each person. Avoid hiring a company who cannot prove they are insured for ice dam removal. Roof leaking? Contact us 24/7 or call us anytime! 612-919-4185. If you answer yes to any of these questions more than likely you do have an ice dam problem and you should consider hiring us. 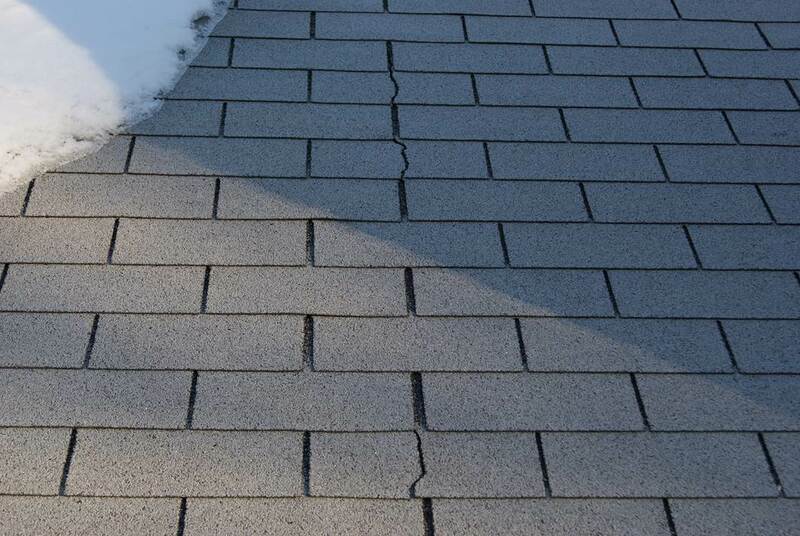 Do you see a lot of snow on your roof and have water leaking inside your building? Do you see icicles hanging down over the roof edge or gutters? Do you see a large wall of ice along the roof edge? Do you see a lot of ice where two roofs come together in the valleys? Do you see water leaking or icicles forming behind the gutters? Do you see water leaking or ice forming through the soffits? Do you see water leaking or ice forming on the exterior/siding or windows? Call us about your ice dam problem 24/7 @ 612-919-4185. Ice dams are caused in many different ways and every property is different in some aspect, but ice dams are all caused by snow melt. Ice dams form when the snow melts in warmer areas and freezes again on colder surfaces such as the overhangs and gutters. Continuing melting and freezing causes the ice to grow and work its way under your roofing materials causing damage to your roof and eventually causing leaks. There are many common reasons the snow will melt from your roof such as. Ice dams will shorten the life of your roof and property if not properly prevented and removed. In many cases we have seen roofs less than five years old completely ruined from ice dams. The ice will lock onto the roof and freeze and expand continually until the shingles have no choice but to split as shown in the picture. We have seen many roofs completely cracked from the gutters all the way up to the ridge cap. It is cheaper to prevent ice dams and to remove them than to replace your roof early. Other dangers of not removing the ice dams include splitting, warping and loosening of the gutters and downspouts, roof deck warping and rotting, mold, premature roof failure and ultimately leaks into the property. We can help you with this problem if you’ve had ice dams in the past years, or if you are just seeing ice build up on your gutters and roof for the first time. Please give us a call and we can safely remove the ice dams and determine why they formed in the first place. We use the best commercial grade steamers to safely loosen the ice from your roof. No hammers no chemicals! We are fully insured for this exact service. 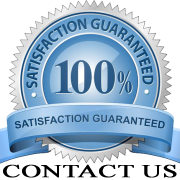 We are very experienced and have great references. A customer on Google said, “Jesse did an outstanding job removing our ice dam! I could not be any happier. His crew was great as well. (Thanks Glen and Bob!) Jesse explained the whole process and why using STEAM and not PRESSURE is the most important process in removing ice dams. He also helped us determine the underlying cause of our ice dams. For almost 20 years we thought we could only avoid ice dams by using a heating coil. THANKS JESSE for all your help!! !” Choose to hire us now. The following checklist is intended to help prevent ice dams from forming on your property. Caution: The suggested services may require a professional. Rake or shovel all the snow from your roof if the heat vents or ridge vents and pipes do become covered. 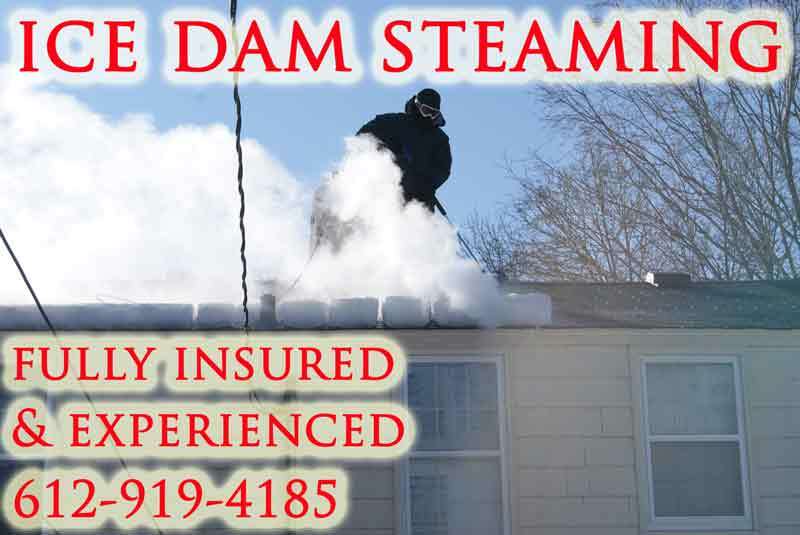 We also travel to ANY US state in need of ice dam steaming. We served the surrounding areas of Boston MA and Buffalo NY in 2015. Here is a MPR News Story about us and other MN companies in Boston.